of the Common European Framework of Reference for Languages. Unforeseen Predicaments in Vienna – numbers, phrases and immediate help. 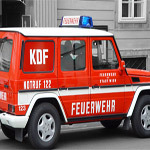 No matter if you are in need of immediate medical help, have an urgent plumbing problem in your apartment, have lost your purse in the underground, or you are stranded with the car in Niederösterreich. With the right set of numbers, vocabulary & phrases, this course will get you ready for the necessary steps to get successful & fast help in German. Exchanging information, pronunciation of spelling & numbers. Helpful phrases for telephone, short emails or faxes. Communicating your name, telephone number & personal data correctly on the telephone or in any situation. “A wie Anton und nicht E wie Emil!”. . . somehow the Austrians never get my vowels straight! But after this class, they will. YOU LEARN: numbers, words, & phrases for giving & receiving directions, exchanging personal information, etc. 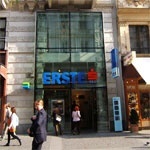 Money wise – everything about Bankomat, Kreditkartenzahlung, bills, checking accounts and tips. Still don’t understand all the options at Austrian Bankomats, need to figure out the details of your recent bills or don’t know how to communicate to the waiter how much he can keep of your 100 Euro bill? Take this class about financial basics in German. YOU LEARN: numbers, words, & phrases for asking question & understanding financial matters in German, etc.. Successfully using the German “Perfekt” Tense – Understanding and talking about what happened yesterday. You already know a number of important verbs but mostly understand & use them in the present tense? Learn how to use your existing knowledge of German to correctly talk about yesterday, last weekend or 2003, when you still lived in London. YOU LEARN: how to speak & form sentences about past events. Helpful phrases when there is no time to think –it is also about understanding them! False friends – not everything that sounds the same means the same thing! This course also provides you with correct information about all the phrases or words that sound so familiar but always lead to misunderstandings. “Das war kurios!” – no, it is not curious. 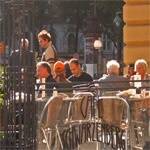 “Die Lokale waren nett” – and no, it is not the locals. 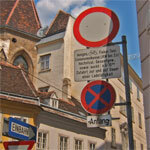 Understanding & knowing about Austrian driving & parking rules. Hopefully you have found out by now that cars to the RIGHT always come FIRST. This and much more needful information about the endless set of traffic & parking rules, signs and “unspoken” regulations is offered for everyone who does not take taxis only. Pronunciations – why do I try so hard & people still give me weird looks or immediately switch to English?! Very simple but extremely helpful training might really improve your communication with Austrians. 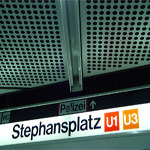 Exercise words with ch, ck, st, vowels & Umlauten to begin to be understood when using your German! 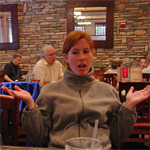 Everything about going out – Information on reservations, ordering, tips and much more. “Wir haben nur Wasser mit Kohlensäure, oder wollen Sie Leitungswasser?“ – If you don’t explicitly order tap water, you will probably get water with a big amount of gas. “Zusammen oder getrennt?” Yes, with 5 people on a table, they will still ask you if you need one check or five. 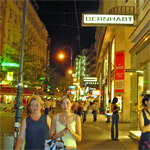 YOU LEARN: words & phrase about going out in Vienna. 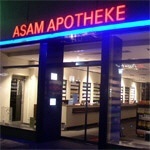 Handling illnesses, pharmacies & doctors in German. Finding the right pharmacy at 2 am, talking about body parts and pain etc. “Hier tut es weh, aber nur, wenn ich einatme.” – This is the spot, where it hurts, but only when I breath in! Or “Ich vertrage kein Penicilin!” – I am allergic to Penicilin! Public Transportation in Vienna. 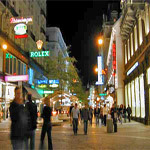 Vienna has one of the best public transportation systems of all the cities in the world. This course will help you successfully use the “Öffentlichen” in providing you with information about ticket machines, lines & very helpful online services.